There are those in the grand old party who fear that vacating such seats to the JD(S) could prove detrimental to the party’s vote base in these regions in the long run. 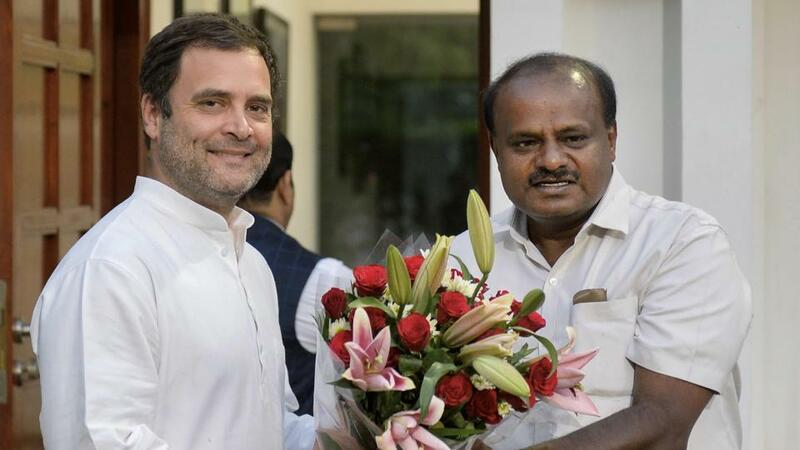 Bangalore: The by-polls in Karnataka, where the Congress-Janata Dal (Secular) alliance won two of the three parliamentary seats and both assembly seats, is proof that their electoral arithmetic is working on the ground. But there is a deeper lesson that the Congress needs to take away and perhaps apply nationally. A tough decision the party took was to give away the Mandya seat to the JD(S). This is a prestige seat in the heart of the state’s Cauvery belt where both allies have fought a bitter battle for decades. The return gift it received for having a cohesive alliance was the massive victory it got in Ballari. Karnataka offers a complex political landscape which comprises different regions where electoral dynamics are very different. The Congress, in most of the regions, fights a head-on battle with the BJP and then there are seats like Mandya, in the Old Mysore region, where the BJP is insignificant and the battle has been between the Congress and the JD(S). The party had little choice but to let go of Mandya as it had lost the seat to the JD(S) in 2014 – albeit by a wafer thin margin of less than 0.5% – and there was major resentment in the local unit. But the Congress leadership bit the bullet. As expected, not all Congress votes in Mandya transferred to JD(S) candidate Shivarame Gowda, and though he won by a margin of over 3 lakh votes, the joint vote share of the parties dropped from 87.54% to 64.18%. The BJP, which had only a 7% vote share in 2014, grew to around 27%. There are those in the Congress who fear that vacating such seats to the JD(S) could prove detrimental to the party’s vote base in these regions in the long run. They fear that castes which are opposed to the Vokkaligas, the backbone of the JD(S), and had lined up behind the Congress may feel alienated by the party and possibly shift to the BJP. In fact, they see the 20% gain the BJP has made in Mandya as being precisely due to such votes. But coalition politics is a risk-return tradeoff and letting Mandya go benefitted the party in the larger context, both in terms of building a cohesive coalition perception and, of course, seats. The most tangible gain was in the Ballari seat, in the Hyderabad Karnataka region, which represents the direct Congress versus BJP landscape. The Congress candidate in Ballari, V.S. Ugrappa, won by a margin of over two lakh votes in a seat the party has lost consecutively in the last three parliamentary elections. The joint vote share of the two parties jumped from 44.1% in 2014 to 60.7%. This shows that all JD(S) votes transferred to the alliance candidate. In an assembly election, stakes are high for a regional party like the JD(S), but its vote base may be splintered in a parliamentary election. It is interesting because the JD(S) candidate in 2014 polled only around 12,000 votes (1.26%), but in the assembly election in 2018 the JD(S) candidates from the assembly segments in the parliamentary constituency polled around 75,000 votes. This is because, in an assembly election the stakes are high for a regional party like the JD(S), but in a parliamentary election the JD(S) vote base is not galvanised enough and may be splintered. However, one could infer from the Ballari result that the entire assembly poll vote base of the JD(S) shifts to the Congress in a parliamentary poll as well when the two parties are in an alliance..
Further, in the Shivamoga seat, the Congress fully backed the JD(S) candidate, Madhu Bangarappa, and the results show that the alliance votes largely transferred to the JD(S) candidate. Their joint vote share jumped from 42.8% in 2014 to 45.8%. Though the alliance candidate lost by a small margin of around 5% votes, the message to the BJP is that the alliance arithmetic makes it a very close fight, even in seats like Shivamoga where it has won traditionally with margins as high as 30%. This is important for the Congress because, numerically, there are a much greater number of seats seats where it fights a close head on battle with the BJP and this may broadly apply nationally as well. It is clear that the Congress stands to gain more, in terms of numbers, from the electoral arithmetic. Also, the fact that its gains will be the BJP’s loss makes the alliance logic even more compelling. Further, the by-poll results could be seen as an indication that while alliance arithmetic does not matter much in a seat like Mandya, it does matter a lot when the fight is against the BJP directly, especially in BJP strongholds. This is because the cadres of both alliance partners sense a chance to claw their way back in seats where they usually throw in the towel without a fight. As the country heads into the 2019 elections, the Congress is attempting to create strong regional alliances. This is where the Mandya lesson is important. Many regional parties compete electorally with the Congress and hence there is an inherent friction in building alliances and sharing seats with them. Making sacrifices in terms of both seats and space to regional players is the only way it can build trust and a cohesive coalition identity. That identity is essential for the transfer of votes at the cadre level. In this process, there would be fears of alienating caste vote bases and long term repercussions, but that risk needs to be taken to survive in the 2019 battle.